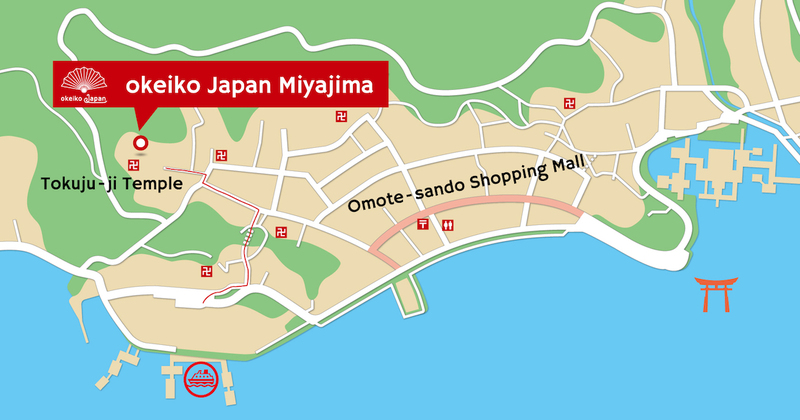 Access Map okeikoJapan Miyajima - Japanese cultural activities, hands-on experience in Hiroshima! (A)After leaving the ferry terminal, we will pass through the tunnel on the way ahead. (B)Go through the tunnel and turn left at the intersection at the end. (C)Proceed 100 meters and turn right at the end. (D)Turn left at the next intersection. (E)At the end of the street is okeikoJapan Miyajima.